The responses to this month's mystery birds were very informative and I'd like to thank all those who posted their thoughts regardless of which side they were on. I learned a lot from this exchange. Excellent! I had a quick look at the oriole, my first guess was a Baltimore/Bullock's but I took it back. The bill pattern is actually more similar to Orchard, which does have grey on the bill (I had to read my text!). Also this bird is not a juvenile, its an adult female from what I can gather. I will have to look at some of my photos of specimens to give a more intelligent answer, at this point in time I don't know what it is. The bill looks too thick for Orchard, but the branch in the background may be part of the problem. The legs also look too thick and bulky for Orchard. If this had not been in the hybrid zone I would have more confidence, but since its from there 'Northern' orioles can look like anything between a Baltimore or Bullock's. The strikingly dark lores are a point against Orchard. When I have more time I will look into it, see if I can come up with something conclusive. Shawneen [Finnegan] and I took a look at the "Orchard Oriole" photo and think that it does look OK for an Orchard. I agree the legs look a bit thick in the photos (perhaps even for just about any oriole! ), but the bill and general plumage look OK to us, and that little dark area in front of the eye doesn't seem totally out of line and I wonder if it was artificially enhanced in the photo. For the life of me if the bird is not an Orchard Oriole then I haven't a clue what it is!! One problem with hybrids is the extreme variability they exhibit. In the absense of measurements I think it would be very difficult to prove that the bird in the photo is not a hybrid. But that doesn't prove that it is a hybrid either. Kenn Kaufman (The Practiced Eye, Notes on female orioles. American Birds 41:3-4, 1987) includes two photographs, both of which look very similar to the mystery bird. In the absence of any other evidence, I am leaning toward Orchard Oriole, but those thick-looking legs still bother me a little. 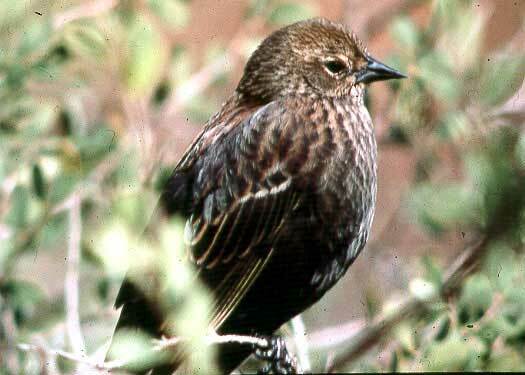 This is definitely a 'bicolored' Red-winged Blackbird, a female. It was photographed near Berkeley, California. The solid blackish belly is found only in this race of Red-winged Blackbird and in the Tricolored Blackbird, both of which are confined to the far west. Males of these two are easily separated, although people unfamiliar with them often overlook male Tricolored Blackbirds in the fall when they are in fresh plumage. At that season, the outer row of lesser coverts are decidedly buff rather than pure white. The deeper, darker red color to the rest of the lesser coverts of Tricolored Blackbird, compared to the more orange-red of Red-winged Blackbird is a good clue. Females of these forms are notoriously difficult to identify, but when I showed this photograph at a recent Western Field Ornithologists meeting, Phil Unitt pointed out that the rich reddish fringes to the back were diagnostic for Red-winged Blackbird and never found in Tricolored Blackbird. Although this color may be muted in some Red-winged Blackbirds, I agree with Unitt that if the bird shows this feature, it is a Red-winged and not a Tricolored which invariably have cold gray fringes to the back feathers. Several people were led astray by the rather stubby bill on this bird, but it is not stubby enough for a Brown-headed Cowbird and the colors are wrong for Shiny Cowbird. Bill shape in Red-winged Blackbird is variable, but Tricolored usually shows a thinner, longer-looking bill, especially at the base than on the mystery bird. Also I believe, that "Bicolored" Red-winged Blackbirds tend to have shorter bills and shorter tails than other races. The original mystery bird photos are below. 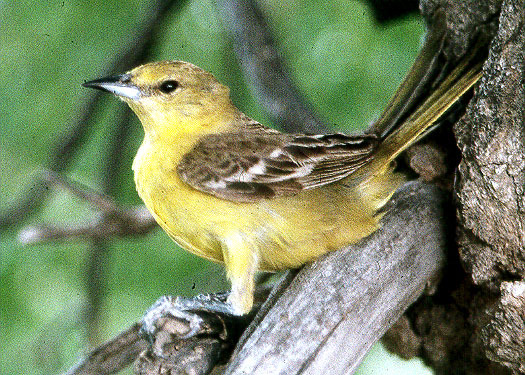 This mystery oriole was photographed 19 June 1990 at Cimarron National Grassland in Kansas and is contributed by Don Roberson. Click on image to view full size. Continuing with Icterids, here is a puzzler from California contributed by Albert Ghiorso. Click on image to view full size. What do you think these birds are? Please click here to view comments or add your own. Thank you very much for contributing your thoughts.